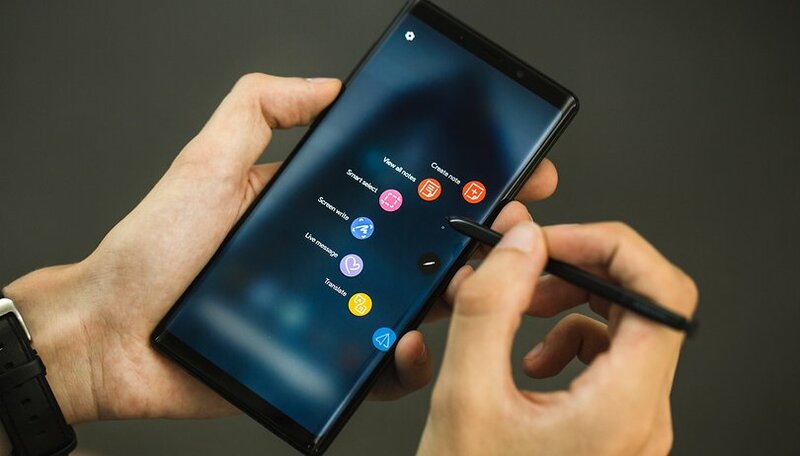 The new Galaxy Note 9 S-Pen is physically almost indistinguishable from the previous generation; at first glance it can only be differentiated by looking at the button on one side, which is now slightly smaller. This is parallel to how the Note 9 is not a real revolution; its S-Pen represents the natural evolution of the brand. Inside the S-Pen you’ll find a battery, which Samsung more specifically calls its supercapacitor that charges wirelessly while the S-Pen is plugged into the smartphone and keeps the Bluetooth LE connection between the pen and phone active. This trick is necessary to enable many of the remote functions of the stylus. Why a supercapacitor and not a battery? Supercapacitors have the advantage of not degrading over time like normal batteries. They have no problems staying charged and they recharge extremely quickly. The only real disadvantage of this technology is that the supercapacitors on average contain far less energy than a lithium battery of the same volume, so the S-Pen only has 30 minutes of battery life away from its host device. Once the available power is exhausted, your smartphone will ask you to reinsert the S-Pen in its housing if you want to use it as a remote control. Fortunately, charging is incredibly fast (15 seconds) and you can use all the passive functions of the S-Pen even when your battery is low (in practice, you can write and use it to touch the display). However, Samsung has succeeded in making this disadvantage its own advantage: the S-Pen, thanks to its supercapacitor, has no perceptible impact on the charge of the smartphone’s main battery. As history has taught us, Samsung isn’t famous for giving users too much freedom of choice. The Galaxy S8’s Bixby button was initially reprogrammable and was then removed with subsequent updates. With the S-Pen, the Korean brand has done just the opposite: not only is every action related to the S-Pen customizable, an SDK is also available to app developers that allows them to better integrate all the functions of the Samsung stylus and the button that were added in the latest generation of the device. I think this is what has fascinated me most about S-Pen thus far: you can choose the action you want to perform when you remove the pencil, either when the screen is off or the screen is on. You can also enable or disable many of the available features. Like any addiction, it began out of curiosity. I started using the S-Pen almost only to confirm in my head that I didn’t need it. Scrolling through long feeds like Facebook or Twitter? That’s much more comfortable with your fingers. Navigating the user interface is much each easier to grasp when you use the smartphone in a classic way. I lost my artistic spirit years ago, so drawing is no longer part of my day. So why do people love this little pen? Then it happened, almost without me realizing it. I found myself using the S-Pen more and more often. I could grab screenshots in the right size without having to crop them later, create GIFs by recording in a display area of write animated messages. I even found myself writing notes in Samsung’s virtual notebook instead of trying to keep my ideas in my head or putting them in Google Keep as I’ve always done. The improved precision of finger input has opened up new ways to use browsers. For example, you can use the desktop version of Google Analytics on the Note 9 without constantly zooming in and out, which is really convenient. The most convenient function I’ve found is that you can press on the S-Pen button once to go back a page. You can also press the button twice to go forward in Google Chrome, which is useful if you use the browser to read news or if you have to open several search results in a row. You can also use the pen to control music on Spotify, but only while the screen is on, which is a major limitation. It might be useful sooner or later to open the camera and the remote shutter for selfies and normal photos, although for now I’ve only tested this function out. There’s a bunch of functions that you’ll probably never use: free handwriting text input, air commands, various shortcuts to functions and apps, etc. And in all likelihood, the S-Pen will not be the main way you interact with your device. But knowing that you have an extra ally, a secret weapon, or an ace up your sleeve that you can use at any moment makes the Note series really unique, and I’m happy to have finally understood what makes the S-Pen a must for so many users. The S-Pen can be a real convenience sometimes. Have you ever used a Note series smartphone? What do you think about Samsung’s S-Pen? This phone has every premium feature's most consumer's will ever need. The display & storage king. Just think 1TB of storage in your pocket or purse. Probably not needed but it's a welcomed feature. Samsung is still at the top of their game! Is it worth the 1,000 dollar price point, yes?